While Agent Ade has been pondering his floral nemesis, I too have been thinking about my own dark secrets. While I like to think I’m pretty competent in the kitchen and can easily throw together a yummy supper from whatever is growing in the garden or veg plot, even from the weeds growing next to the veg plot (don’t knock it ’til you’ve tried it, nettle pesto is the business), I know that I, too, have my weaknesses. For me, the thing that I’m really not very good at, is making jam. 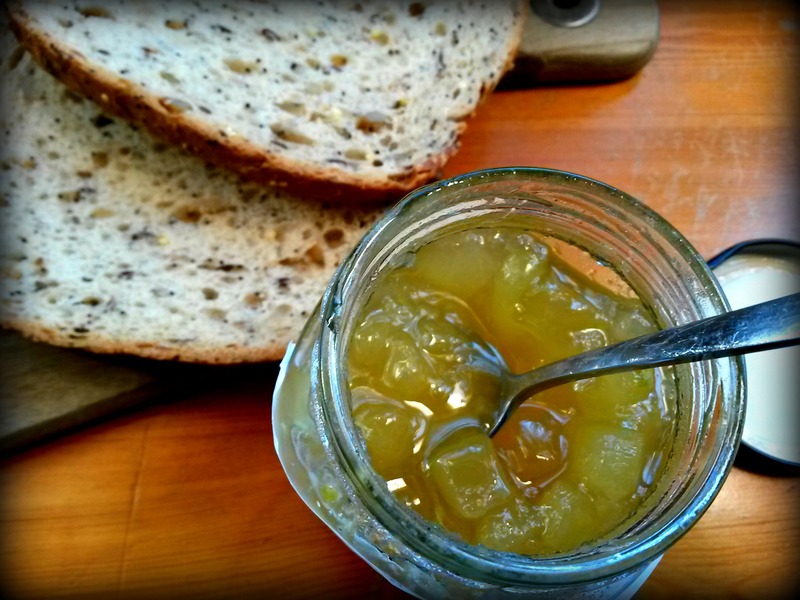 Whereas most recipes lend themselves to a little bit of improvisation, you really can’t ad lib with jam. It’s a very scientific process: you have to ensure there is adequate pectin to make the jam set; you have to maintain a steady rolling boil; setting point is achieved at precisely 104.5°C; you must perform a wrinkle test to make sure you have attained said setting point. I, generally, have a laissez-faire attitude to cooking. I have no clue what a rolling boil is. I don’t own a preserving pan or a jam thermometer so the idea of a perfect setting point seems about as achievable as, I dunno, British economic stability. And as for the wrinkle test, although I dutifully perform it each and every time I make jam, I have no clue if I’ve ever achieved the necessary levels of acceptable wrinklage. But that doesn’t stop me. Each summer, I pick fruit, chop it up, boil it with some sugar and jar it. Often it’s not very well set and I can usually spot a bit of (horror!) crystallised sugar around the edge. I’m sure Thane Prince would be appalled and have me banished to the Tower. I suppose technically, it’s not jam at all but rather a sort of sweetened, fruity gloop. But it’s nice on toast and Ade hoovers it up by the jarful. Maybe not my latest attempt, however. 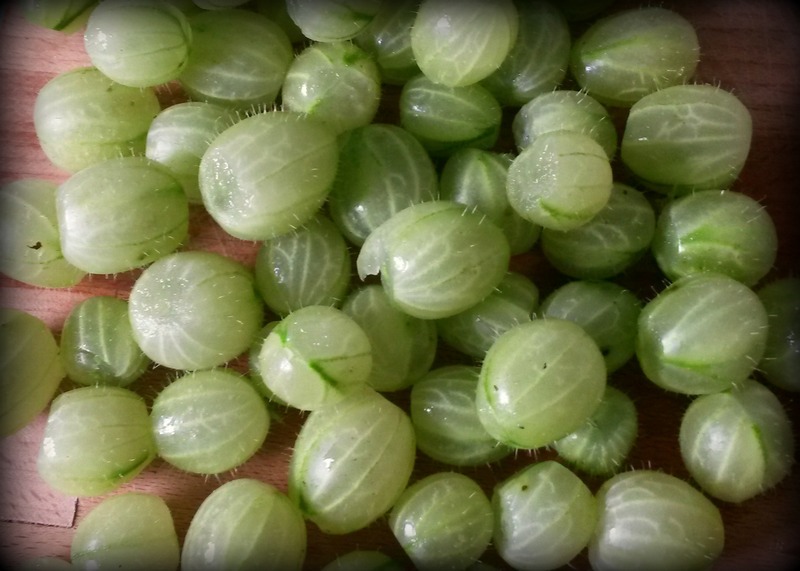 It’s the first year we’ve had a decent crop of gooseberries, and I thought I could get a couple of small jars of jam out of them. I followed a very simple recipe, reducing the quantities as I didn’t have anywhere near 1kg of fruit. I don’t know what happened. I think it was the rolling boil that got me again. Setting point was definitely not reached. I’ve ended up with, what looks like, two jars of runny chicken stock. Which I suppose is quite an achievement in one sense. I’ll leave it for a month or two, see what happens. I’m sure I’ll be able find a use for it if it doesn’t quite work as jam. It might make a nice marinade for meat. Or a glaze. A fragrant adhesive for floor tiles, perhaps. It doesn’t really matter. As my homeland finds itself in the kind of self-inflicted pickle that would sour even our sweetest cucumbers, it’s easy to feel despondent. Which is why it’s so important to seize the simple pleasures. There is something joyful about picking your homegrown fruit, something soothing about the repetitive act of stirring, something comforting about stashing away jars of sweetenedfruitygloop® for the chilly autumn mornings ahead. I heartily recommend jam-making, even if, like me, you’re not very good at it. It’s okay not to be good at jam-making. 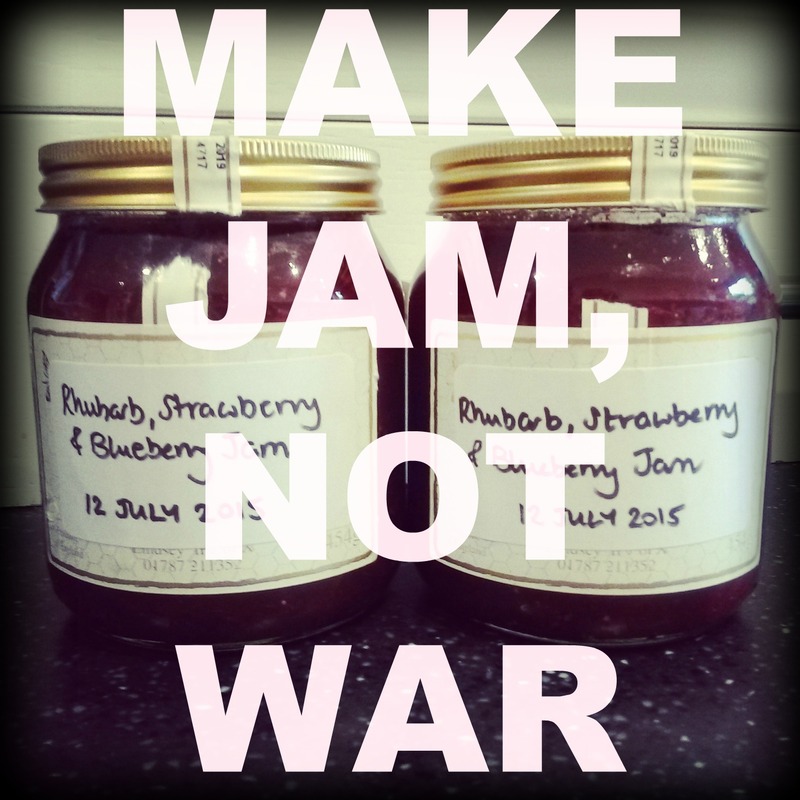 It is, after all, only jam-making – not frontline politics – and incompetence, at hobby-level at least, is excusable. Spread the love. Love the spread. Loved this piece – it really made me giggle. Some priceless lines in there. And keep up the jam-making. My jam making is a bit hit and miss too. But grilled mackerel is great with gooseberry and they won’t mind it a bit on the runny side. I am so, so sorry. Bummer about the jam, too. I’ve never had luck with cooked jams. Maybe the lesson is Carpe diem! Eat your fruit now? We eat as much as we can but there’s a lot of it! Jamming is definitely the way to go! I didn’t have pectin for my last batch of strawberry jam, so just bunged in as much lemon juice as I thought was needed…. Thicker jam would have been better but it’s still jam. As a woman I know who does make jam for a living once said to me ‘runny jam doesn’t kill you’ 😉. Exactly! My jams usually taste pretty good, as I said, Ade loves them, but they probably wouldn’t win any prizes! Wonderful post! And I wholeheartedly agree with the sentiment “runny jam doesn’t kill you.” (It also tastes very good in yogurt.) Also, want you to know we are rooting for you across the pond. It was very unsettling to wake up and hear about Brexit on the radio. Of course, we have our own unsettling situation in the U.S. Oh, my!